The Samsung Galaxy S7 is one of the most awaited smartphones of next year. Everyone is curious about what the next Samsung Galaxy S devices will look like, and especially, about how powerful they will be. It’s safe to expect a Galaxy S7 and a Galaxy S7 Edge since this duo is the one Samsung got us accustomed to. Now, it seems that we may see four models, the “regular” Galaxy S, the Edge, the Edge Plus, and the S7 Plus. This would be a first for Samsung to release four different devices at the same time, and it probably wouldn’t be the cleverest thing to do, because too many models can result in a total chaos in terms of sales. Some leaked schematics show a 5.1-inch Galaxy S7, a 5.5-inch S7 Edge and a ginormous 6-inch S7 Plus. The Edge Plus’s size was not leaked, but if the serial leaker, @evleaks, is right this model will also be launched by Samsung in 2016. Four high-end models definitely seem to be a little too much, especially since a source close to Samsung recently stated that the company will rather focus on budget phones next year. The launch of four different S- series devices definitely doesn’t prove that the so-called source was right. Or the leaked information isn’t right. They definitely can’t be both right at the same time. As far as the current leaks show, the Galaxy S7’s design will be a lot similar to the one of the S6, at least when it comes to measurements. 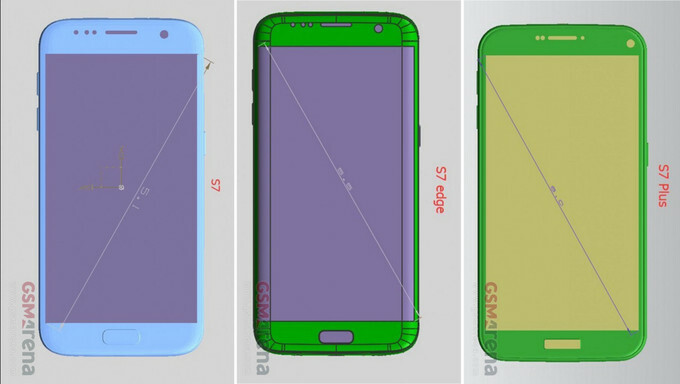 The 143mm height and 70.5mm width of the new model coincide with the measurements of the S6, but the leaked schematics also show that the new model will have a curved back. The S7 Edge’s leaked schematics show a flat back, which was expectable given its curved screen. The new Samsung devices are thought to be unveiled as soon as February, so we will find out more about them in the next few weeks. We’ll know more exactly how many models will be released and what they will be like. Stay tuned, and we will keep you in the loop.